Summary: Say good-bye to old-fashioned steel knives! Ceramic rarely needs sharpening! Introducing the razor-sharp, feather-light YoshiBlade ceramic slicing knife. 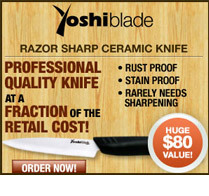 Unlike steel knife blades, which ‘roll up’ along the cutting edge, ceramic knives like YoshiBlade stay razor-sharp because they’re made of diamond-hard, stain-proof zirconium oxide. In fact, this space-age material is so hard that professional chefs actually use ceramic to sharpen their expensive steel knives! Your YoshiBlade ceramic knife is rust- and stain-proof, easy to clean, and will not affect the taste or smell of food like steel knives. – Won’t affect food’s taste, plus rust and stain-proof! – Made with razor-sharp, long-lasting, diamond-hard zirconium oxide! – Say good-bye to old-fashioned steel knives! Ceramic rarely needs sharpening!